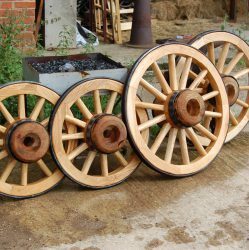 A recent project which also turned into a video for the heritagecraft youtube channel was to make a pair of wooden wheelbarrow wheels. Now its often said the smaller the wheel the harder it is too make and having made a number of small wheels lately I can understand the sentiment. A wheelbarrow wheel differs from a conventional carriage wheel in that its set flat. If you look at a carriage wheel you will see the spokes are set at an angle which causes the rim to set out from the vehicle which is referred to as being “dished”. the degree of dish is a much debated topic at wheelwrights gatherings. The theory has it that the heavier the load the greater the dish up too a maximum about 5 degrees. Whereas a wheelbarrow wheel doesn’t have dish, its flat as its designed to be supported between two shafts. 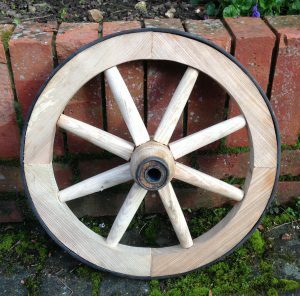 This project comprises two 16 inch wheelbarrow wheels each with 8 spokes. By way of a change the spokes were turned on a lathe, rather than using a spoke shave. The wheel is then finished by the fitting of a solid steel tyre, heated up in a fire to expand the steel, slipped over the wheel and then shrunk back with water. So watch the process have a look at the Heritagecraft youtube channel. A signpost to show you the Way!